On this date in 1922, my second great-grandmother Josephine Susan (Campbell) Bennett passed away. She was born in 1859 in San Antonio, Texas, and was the granddaughter of the first mayor of San Antonio, William John Smith. Her father was not only a Campbell, but William Wallace Campbell, so I can only assume she had a wee bit of Scottish ancestry. 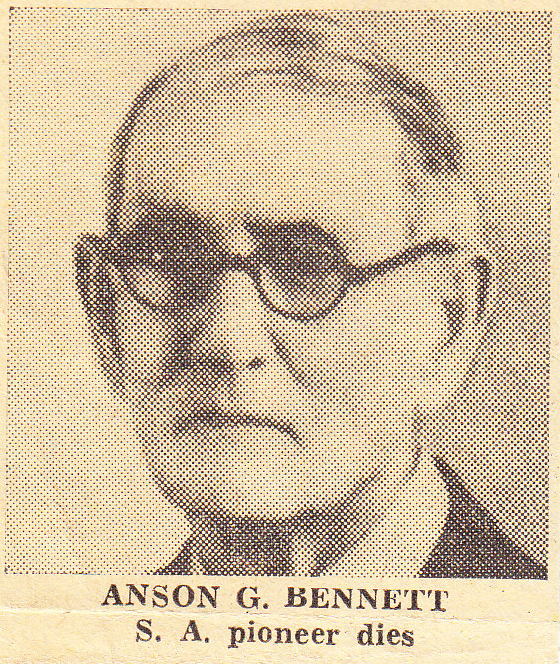 Josephine married Anson G. Bennett, who hailed from Missouri. Together, they had eight children, including my great grandfather Susan Campbell Bennett. I haven’t found many more records besides census records of her life, but her daughter, also Josephine, was quite the social butterfly and was written up quite a bit in local papers. My great-grandfather Herman Wild’s birthday was only two days after his father’s. Herman Wild was born in San Antonio, Texas, 8 Mar 1877, to Fridolin Wild and Lena Hoyer. Like his father, Herman went into sales and worked at a department store named Wolff and Marx for almost 30 years. Herman married Susan Campbell Bennett 15 Jan 1908. There is no photo of his grave on FindaGrave (yet, I requested one), but there is text from his obituary, which provides a wealth of information. He apparently died of pneumonia on 20 Mar 1928. 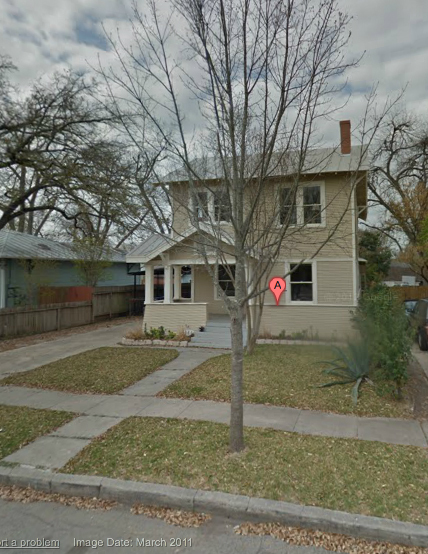 Google Street View of 232 Lotus Ave. in San Antonio, Texas. His obit and other records list his address as 232 East Lotus Ave in San Antonio, Texas. 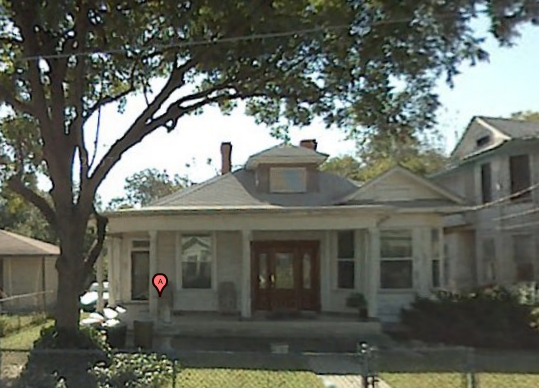 There is a neat old house at that address on Google Maps Street View (if Street View can be trusted–I find it to be often inaccurate). William is listed as a master mason in the 1860 U.S. census, which I found on Ancestry.com. William and his wife, Susan Elizabeth Smith (1830-1864), passed away while their children were still young. I found two of Josephine’s siblings living with relatives in the 1870 census, but haven’t tracked down Josephine’s location in that particular year. The siblings were reunited and living together when they were in their 20s, according to the 1880 census. William earned a mention in Daughters of the Republic of Texas because his wife, Susan, was the daughter of William John Smith (aka John William Smith, a prominent figure in the battle for the Alamo and the first mayor of San Antonio). As of yet, I have not been able to discover the names of William’s parents, nor the area of Virginia from whence he came. There are a lot of William Campbells in Virginia around the time he resided there for me to sort through. Josephine married Anson G. Bennett in 1881 and they had 8 children, including my great-grandmother, Susan Campbell Bennett (1884-1966). This is my first stab at Saturday Night Genealogy Fun (albeit a day late) — a concept championed by Randy Seaver on his Genea-Musings blog: http://www.geneamusings.com. This has been a really educational exercise to undertake — I learned about a numbering system I hadn’t been exposed to before, I further investigated a relative that I hadn’t spent a lot of time on yet and I found some interesting discrepancies in his census records that will require some work to clear up. 5) If you do not have a person’s name for your “roulette number” then spin the wheel again – pick your mother, or yourself, a favorite aunt or cousin, or even your children! Shame on me, I know (actually, it’s even worse; first, I Googled it). Google also led me to this better explanation at ancestry.com. Note that there is a typo, and number 15 should actually be great-grandmother. 1) He was born in October 1859 in Missouri. 2) He married Josephine Susan Campbell after moving to San Antonio, Texas. 3) His father was a merchant and Anson worked for him in his store before marrying my great-grandmother. The above has been gathered from a family history previously compiled by a relative and by searching federal census records. The one sticking point is that the state of birth information for his mother varies — either given as Missouri, Tennessee or Virginia, depending on the census year. This could mean that I’ve been viewing the records of two (or more) different Anson G. Bennetts. It could also mean that a recording error was made or that the wrong information was inadvertently given to the census taker in a given year. Obviously, more work needs to be done to clear this up.